NOW THAT 2010 IS OVER, THE FUN begins as we sort through the best and the brightest in Custom Letters! 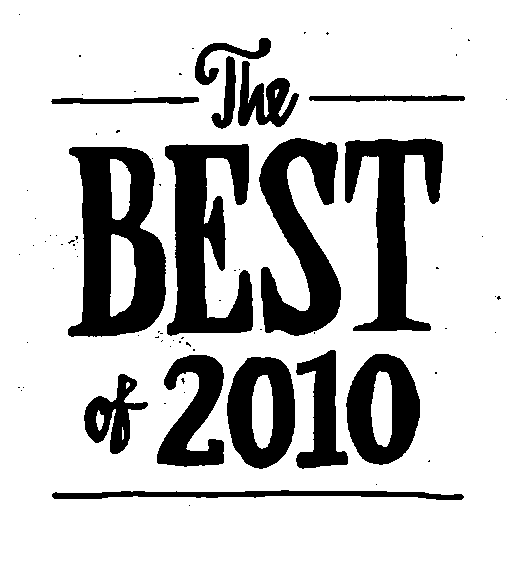 Our Best of 2009 featured more than 600 images, our Top 10 lists, and our Person of the Year. Last year, we scoured the internet, including hundreds of personal sites, yet took in a relatively small number of submissions. We hope to get more subs this year, so if you or anyone you know create Custom Letters, please pass on the link! We don’t want to miss anyone. The Custom Letters category includes calligraphy, sign painting, graffiti, stone carving, digital lettering, hand lettering, paper sculpture, and original type design. It could also involve making letters with sticks and berries, or carving letters into a tree. It’s an elastic category. The Custom, in this instance, means built from scratch; we ARE NOT looking for customization—a type treatment or 3d treatment—of an existing typeface. Again, no type treatments. • The deadline to submit is Sunday, February 6, midnight Pacific time. We will be publishing our Best Of the third week of February. • E-MAIL ADDRESS: lettercult [AT] gmail.com. You can submit for yourself or others. You can include the actual files or submit links. Please put 2010 SUBMISSION in the SUBJECT FIELD. • SUBMISSION FORMAT: .png or .jpg, 600 pixels wide, 72 dpi. We’ll confirm receipt of your submissions, but we won’t contact you after that. There is no limit to the number of submissions you can make, but please edit yourself, and pick your BEST WORK. Please include a link to your site. And please do not send work completed before 2010, or work from 2011. • ALPHABATTLE LETTERS: We’ll be doing something separate once we finish Alphabattle so INDIVIDUAL LETTERS will stay separate from the Best Of. • If you don’t submit, there’s still a good chance we’ll find your piece if you’ve uploaded it somewhere—Flickr, Behance, etc. However, if it’s on your site, and it’s unclear what year you created it, we won’t include it. • We are aware of certain styles that get copied. If you’re aping the current Designer of the Moment, we’d ask you to please, find something original to submit. • If you or someone you know are not on our list of LetterMakers, email us. Finally, I’ve gotten a few questions about why a Best Of would include so many images—why don’t you narrow it down to a manageable number so it’s truly a BEST OF. Well, the continuing goal is to introduce people to Custom Letters, and to celebrate those who are making Custom Letters. It’s as simple as that. Our aim to be inclusive, not exclusive.